Ah, the green monster… It surfaced this week, startling me with its intensity. I’m talking about jealousy and the mean feelings I experience occasionally in relation to diabetes. Every week, the mighty search engine that is Google picks out the week’s diabetes news for me. Most of the time, it includes new research, a dose of doom and gloom where scientists and doctors reinforce the lower life expectancy/increased likelihood of contracting a nasty side effect (Gee, thanks folks) and a Daily Express article telling you to eat this food to avoid diabetes*. This week’s offerings included a video on the BBC where a teenage type 1 spoke about the pump she wears which uses artificial intelligence to monitor her blood sugars and keep them within normal range, and how it will allow her to soar through life. She’s one of the first type 1s to get this pump on the NHS. The nasty bout of whingeing was in part triggered by a letter I received this week relating to my progress on the flash glucose monitoring (FGM) waiting list. At my appointment at the diabetic clinic in September last year, the doctor put me on that oh so elusive list. The waiting list was only the start. After that, a mandatory half-day educational course takes place and then a letter wings its way to your GP requesting they prescribe FGM. Still there I was. ON THE LIST!!! “Happy days, Emma!” I said to myself as I skipped out of the clinic, phoning my mum and then husband to share the good news. They whoop-whooped too. I waited. And waited. “Well, I suppose those half-day courses are over-subscribed,” I said to myself. Friends, patience isn’t among my virtues but I held off writing to the good doctor to request a situation update until the beginning of March. The letter I got in return said there is a cap on funding and until that increases, I’m on a static waiting list. Here’s the thing—I never envy other people their non-diabetes status. A long time ago, my brain must have told my heart jealousy over the impossibility/unlikeliness of a cure in my lifetime was too much of a wasted effort. But when I read of other diabetics and their access to the latest tools and tech, I glow so green I’m practically radioactive. Fortunately, perspective kicked in after twenty minutes or so of mumping and moaning to myself. In the US, two senators have launched an investigation into rising insulin prices (585 percent from 2001 to 2015 for Eli Lilly’s Humalog, for instance), and this in the world’s wealthiest country. Many people have tried swapping insulin types and brands, changing to something that might not work as well for them or worse, stopping it or rationing it. In addition, part of my work at the moment involves communications for a health-based project in two African countries where access to any diabetic medication is seriously limited, and knowledge of how to treat the condition not as wide-spread as it is in the developed world. I don’t have the latest up to date equipment, but I do have insulin (Brexit fears aside), plenty of test strips and all the other bits and pieces I need. The green monster surfaces from time to time, as I’m sure it does with you. Let it do its whinge-y bit and then remind Madam Monster we do live in the best of times for people with diabetes (country dependent of course). If I’d been born 100 years earlier, I wouldn’t have made my 11th birthday. So, Emma 1, Jealousy 0.5. *Yet to click on that one as I assume it’s click bait. In the news this week was a story that the Scottish Government is to increase funding for diabetes equipment. The £10m funding is to be used to improve the management of type 1 diabetes and the priority is insulin pumps and continuous glucose monitoring equipment. Shona Robison, the Health Secretary, said: “We know that insulin pumps and continuous glucose monitoring kits can make it much easier for some people to manage their type 1 diabetes. “Proper control is absolutely key to improving outcomes and preventing complications from developing. Scotland has the third highest rates of type 1 diabetes in the world. A major trial is currently taking place to try to prevent the development of the condition. Researchers have contacted 6,400 families in Scotland. They are inviting children who have a sibling or parent with type 1 diabetes to take a blood test to see if they are at risk of developing the condition. If the blood test shows they are at risk, the researchers are offering them metformin – a drug usually used to treat type 2 – to see if this will keep it at bay. In the news this week was a story about the FDA’s approval of a new insulin delivery system for people with type 1 diabetes – the so-called artificial pancreas. 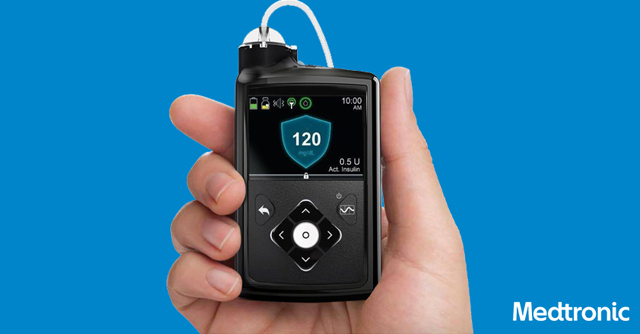 The new Medtronic’s MiniMed 670G hybrid closed loop system is an insulin pump and continuous glucose monitor (CGM). The two devices can communicate. Medtronic’s previous system already had a feature that would stop the insulin pump if a person’s blood sugar dropped too low. The 670G predicts when a person’s blood sugar level is dropping, preventing the low in the first place. It also corrects high blood sugars. This is the first time such a level of automation has been available, which is why the pump is being called an artificial pancreas. However, it still can’t work out what a person is eating. The wearer needs to tell the device they are about to eat and how many carbohydrates they will be ingesting – hence the name hybrid closed loop, instead of fully closed loop. There is still a possibility of mistakes – the wearer under or overestimating the number of carbs they are about to eat – but the 670G will correct the error if blood sugar levels go too far up or down. There are thought to be five other partnerships between manufacturers also looking to develop similar pumps. The pump won’t be available until the spring of next year and Medtronic expects to start rolling the new product out outside of the US from summer 2017. Read Medtronic’s press release here.